Investment quality Turquoise is rare, in fact, less then 1% of Turquoise mined worldwide is high grade Turquoise and a very small percentage of that is considered investment quality by today's Turquoise connoisseurs. Investment quality Turquoise has become one of the most valuable colored gemstones, it has been increasing in value more than 30% per year for several years. In recent years Japanese investors have been the biggest investors of high quality Turquoise and now, (2013), the Chinese are beginning to have a great appreciation for the finest quality of Turquoise. Investment quality Turquoise Jewelry derives from exceptional quality Turquoise, the higher the quality of Turquoise that is used - the greater the value will be in the Turquoise Jewelry. 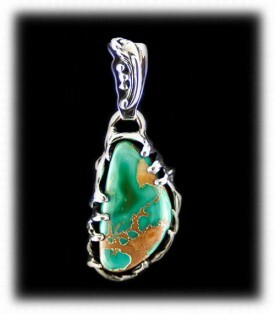 Investment Quality Turquoise Jewelry begins with a foundation and the foundation is investment quality Turquoise. The quality of the Silver and/or Gold work is very important as well! There are many ways to make Jewelry - Hand Crafted, Casted and recently Cad/Cam Designed and Casted. Jewelry from the American Southwest began around 1865 when Atsidi Sani learned how to work with Silver from the Spaniards. For many years the traditional way of making Jewelry here was by hand. Casting or pouring Silver into sand began shortly after Hand Crafted for heavier pieces such as buckles, naja's and bracelets. The use of Turquoise began early and by the 1880's the Zuni Indians began putting the focus on using Turquoise in many unique ways such as needle point, petit point and channel inlay. Most recently, with the advent of the computer age, comes a wonderful new form of Jewelry creation - Cad/Cam - The modern designs being produced with new age equipment are phenomenal and will lead us into a totally new age of Jewelry design. It is certain the new age technology with change everything - including Jewelry. With that said, the age of hand crafted, (bench made, handmade), Jewelry may become a rarity in the future. Gaining momentum to current date, Artisans of the American Southwest have been contiguously pushing the envelope producing spectacular Turquoise Jewelry for many years - hand crafted Southwestern Jewelry is admired worldwide. The highest quality of Turquoise Jewelry from this region of the world is Investment Quality World Class Jewelry! John and Estell Hartman began collecting Turquoise in the late 1960's as kids and then making Jewelry in the early 1970's shortly after they got married. There was a great Turquoise Jewelry boom that began shortly after they began making Jewelry, they quickly realized this was a good business and they should make the most of it. They worked hard cutting their Turquoise and then setting it into Silver 7 days a week and 12 to 15 hours a day for about six months strait. After building up hundreds of pounds of Jewelry they hit the road to sell it in spring, at the ages of Estell (20) and John (21) they sold thousands of rings, pendants, bracelets, earrings and buckles over the summer of 1972. Basically from rags to riches, John and Estell worked very hard and got lucky from doing so! They both agree, it was the high quality of Turquoise they used along with making each piece of Jewelry as high of quality as they could possibly could that made their business a success. 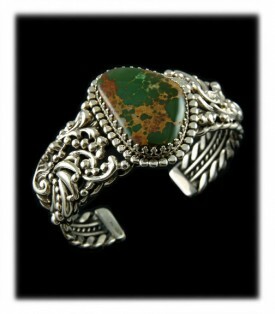 John and Estell moved from Albuquerque, N.M. in 1974 to Durango, Colorado and continued producing some of the finest quality Turquoise Jewelry coming out of the American Southwest. They went through many phases creating many different types and styles of Jewelry, always incorporating fine quality Turquoise. They made Jewelry for movie stars, popular musicians, large entities such as the Fred Harvey Company of the Grand Canyon, Zippo Lighter Company of Tokyo and on and on. Throughout the years, John and Estell have been known as two of the finest Jewelers of the American Southwest. Today John and Estell along with their family, Crystal, Dillon and Dillon's Wife, Nattarika all work hard producing as high of quality unique Jewelry and they use the high grade Turquoise that the John and Dillon have collected since the beginning. Jewelry produced by John and Estell is now in museums and important Jewelry collections worldwide, and now the children, who are grown will continue the family tradition on into the future. We strive hard to produce exceptional investment quality Turquoise Jewelry that we are proud to sell to our customers, our intentions are that the pieces we produce will become good investments for our customers as well as important heirlooms for their generations to come. 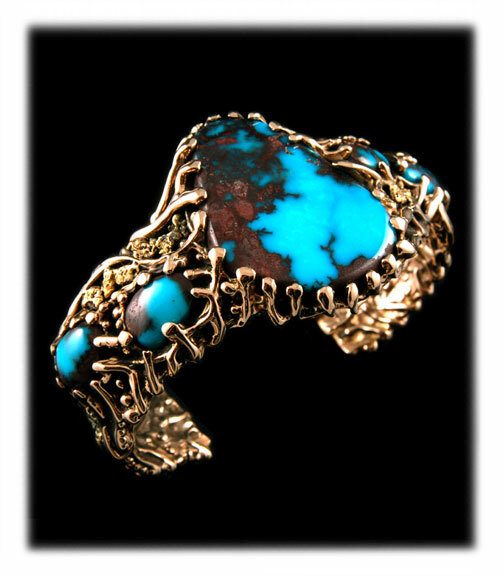 Above is a Bisbee Turquoise Bracelet created in Gold with Colorado Gold Nuggets by John Hartman. This is ultra-grade Bisbee Turquoise which is one of the finest and rarest types of Turquoise on earth, Turquoise mining at the Bisbee Mine ceased in 1978. The blue color range is breath taking and the chocolate brown matrix is luscious! This is a wonderful men's bracelet - it was a commissioned piece for a very lucky gentleman. This is a one-of-a-kind bracelet that can never be repeated and became priceless immediately! 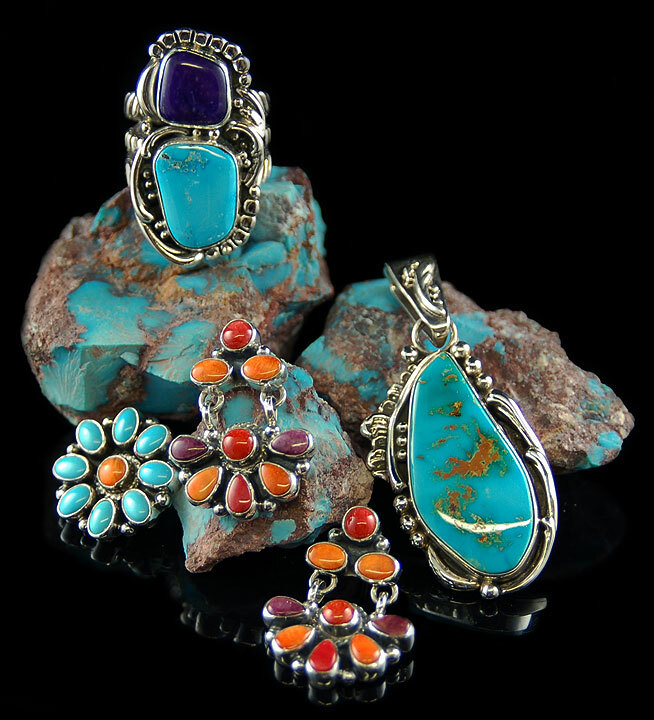 Above and to the left is a spectacular Bisbee Turquoise Ring in Gold created by Crystal Hartman. This investment quality Bisbee Turquoise gemstone was hand cut by Dillon Hartman from natural ultra grade Bisbee rough Turquoise that has been in the family collection for many years. Crystal has studied art her entire life, has had her art on display in museums worldwide and creates exquisite Jewelry collected worldwide as well. This is a marvelous investment quality gold ring that has additional photos on its presentation page, we invite yo to check it out! Above and to the right is a fantastic men's Lander Blue Turquoise Ring in Gold created by Dillon Hartman. We call this our Men's Saddle Ring as it fits like a saddle on your finger. The band is completely round and the streamline design is mounted on the top of the band, like a saddle. This is a very comfortable ring the every man will love. We made these with many different types of stone. 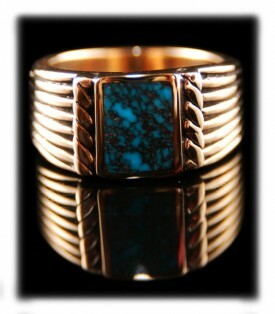 Visit the presentation page for this Lander Blue Turquoise Men's Gold Ring. Above and to the left is an outstanding Blue Wind Turquoise Necklace created by John Hartman. This is a spectacular piece of work, it was made by using a hot jewelers tool to dip into special wax and then applying one layer of wax over another building up the design - it is time consuming, but unique one-of-a-kind designs are created in this manner and then the piece is cast into gold using the lost wax method. This is an interesting method of making Jewelry and the end result is that you get a wonder work of art that nobody else will ever have. We have a good presentation page that we created on Gold Turquoise Necklaces that you may enjoy - check it out! Above and to the right is a very special Gold Men's Turquoise Ring that features a spectacular Red Mountain Spiderweb Turquoise Gemstone. One would hunt high and low for years to find a stone equal to this one and it is very rare and an exceptional specimen. This is absolutely a museum quality piece of American Turquoise from the Red Mountain Turquoise mine located in Nevada USA. The Gold Ring was handmade by John Hartman specifically for this stone - it is a one-of-a-kind ring and it is definitely a investment quality piece of Turquoise Jewelry. Take a look at the presentation page for this Red Mountain Turquoise Ring, there are several other photos and more information on this piece. Above and to the left is an awesome ultra-grade Bisbee Turquoise Gold Ring with Diamonds by Bruce Mead of Arizona. 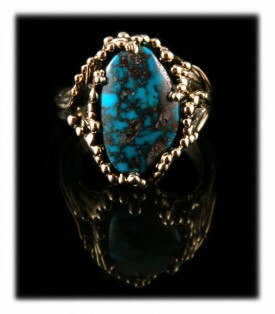 This is an exceptional investment quality gold ring that is a very unusual piece of Turquoise Jewelry. Typically, Turquoise Jewelry from the American Southwest has been made in Sterling Silver, occasionally you might find Turquoise set in Gold, but, you rarely see Turquoise set with Diamonds in Gold from the Southwest. 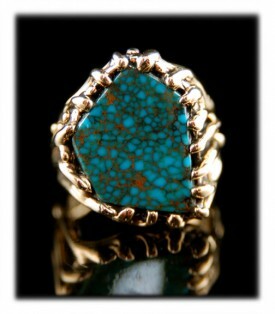 This is and exceptional, museum quality Turquoise Ring that is a one-of-a-kind! Check out the presentation page for this Gold Ring. For that collector that has it all, the Gold Necklace above and to the right is over the top! 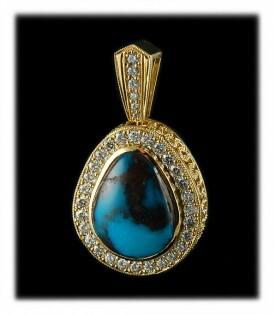 This too, was made by Bruce and this is the center piece of our Bisbee Turquoise and Diamonds in Gold collection. 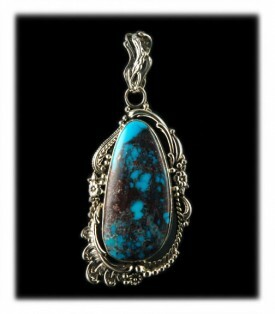 This necklace has it all - the ultra-grade Bisbee Turquoise stone will mesmerize you as it is wonderful. The gold work is fabulous and when you see the reverse side of this piece you will flip! - it has a sunburst inlaid with Australian Opals flaring out from a specially cut Diamond. You must take a better look at this Bisbee Turquoise and Diamond Gold Necklace, there are several more photos as well as additional information that you will find interesting. Sterling Silver is a beautiful precious metal, it has been the metal of choice by Native American as well as Contemporary Artisans of the American Southwest since 1865. Sterling Silver has now become popular worldwide and many people prefer it over Gold. Most investors agree that Silver is a great investment for the future and that it is under valued and slated to dramatically increase in price into the future. Turquoise is absolutely enchanting set in Silver and we believe investment quality Turquoise Jewelry in Silver is a great choice for many. Above and to the left is a gorgeous Sterling Silver Bracelet in a Victorian design and featuring a beautiful Royston Turquoise gemstone. This bracelet was hand crafted by John Hartman, it was made in John's unusual Victorian style. John's Victorian Silver work is unique to himself and his one-of-a-kind pieces are investment quality Silver Turquoise Jewelry are collected worldwide. Take a look at the presentation page on this Royston Turquoise Victorian Silver Bracelet. Above and to the right is a very nice high quality Native American Gemstone Inlay Bracelet created by Alvin James. Alvin is Navajo and a very good jeweler and gemstone cutter that produces investment quality Southwestern Turquoise Jewelry. This handmade Sterling Silver Bracelet is inlaid with all natural gemstones including Sugilite, Spider Web Chinese Turquoise, Lapis Lazuli, Sleeping Beauty Turquoise and Spiny Oyster Shell. Multi color gemstone inlay of this quality is very time consuming to do and it takes a very skilled lapidarist to do it. 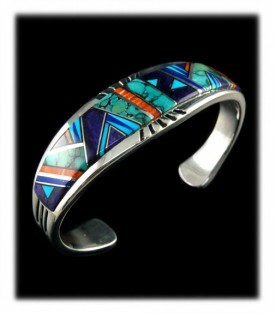 You can see additional photos and information on this Navajo Inlay Bracelet on its presentation page. 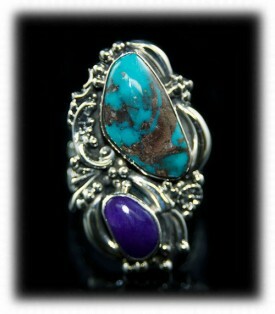 To the left and above is an awesome Victorian Turquoise and Sugilite Silver Ring created by John Hartman. This is a very high quality Victorian style Turquoise Ring that features a gorgeous Bisbee Turquoise gemstone accented with a Sugilite gemstone. The filigree design that was done around the stones is superb and most attractive. Even the ring shank on this ring is beautifully tooled and special. Take a look at additional photos of this ring on its presentation page. 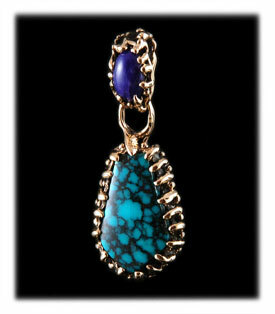 We have created a great informational page on Victorian Turquoise Jewelry that you would appreciate if you like John's work and/or his Victorian Silver designs. 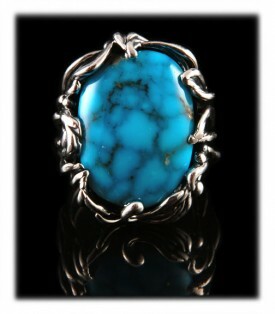 Above and to the right is a beautiful ladies Turquoise Ring created by Crystal Hartman of Durango, CO USA. This Museum quality Turquoise Ring features a spectacular Kingman Turquoise stone with exceptional spiderweb matrix, this is a very hard gemstone to find and stones like this surface rarely! The Silver work on this ring is also exceptional, you can view more photos of it on its presentation page. This is a large ring that would made a nice dinner ring for special occasions. Above and to the left is a beautiful Lost Wax style Royston Turquoise Pendant in Sterling Silver by Crystal Hartman. Crystal's artwork has been shown in Museums worldwide, her focus in life has been art since she was a little girl and she achieved a masters degree in fine art as well. Crystal's Jewelry made in both Sterling Silver as well as Gold is of exceptional quality and design. There is no doubt her Jewelry is investment quality. There is a lot of collateral information on Crystal via her website which can be found from the link above. This Royston Turquoise Pendant is fantastic, it features a fabulous Royston Turquoise Gemstone and lovely Silver work that enhances the stone. Follow the link to find additional photos and information. Above and to the right is a beautiful Bisbee Turquoise Necklace in Sterling Silver by John Hartman. This Museum quality Bisbee Turquoise Necklace is double sided and you will love the reverse side as it has beautiful filigree with a cutout window where you see a large purple Sugilite gemstone. John backed the Bisbee Turquoise gemstone with Sugilite, it is a delight! It is a must to view the reverse side of this piece, go to its presentation page to do so. Above is a Kodiak Bear Claw Necklace handmade by John Hartman. John and Estell mined this Stormy Mountain Turquoise back in 1973 with Cutler Edgar of Battle Mountain, Nevada. Cutler is a historic Turquoise Miner who owned many of the most famous Turquoise Mines from the past. John cut this cabochons used in this Necklace and then proceeded to make this astonishing piece. John has a big history of making Bear Claw Jewelry from his past as he made is for the King family and Bing Crosby. His Bear Claw Jewelry was sold to famous people and many of his pieces are now in exquisite Jewelry collections. 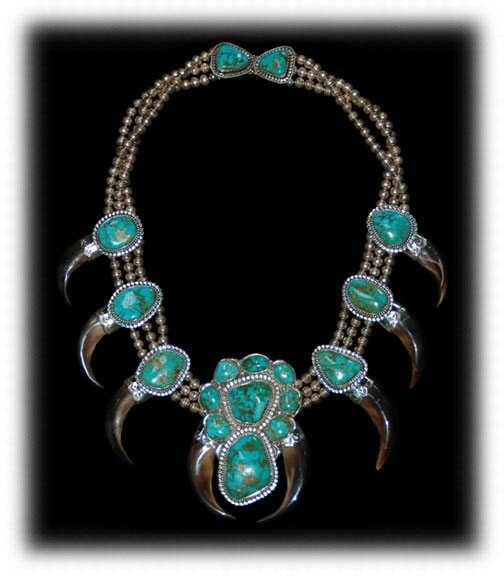 This is a spectacular Turquoise Bear Claw Necklace that can be seen on its presentation page with additional information as well. We invite you to learn more about American Turquoise Rings and American Silver Jewelry by following the links in our Learning Center to other informational pages we have written on different topics directly related to American Turquoise Rings. In addition, we would like to invite you to join our E-Mail Newsletter - about once every other month we send out a Newsletter to inform our members of what's happening with Durango Silver Company, new products, specials for our members and more. We also have a monthly drawing from our member base to give away free Turquoise Jewelry from our company. Please take a moment to become one of our friends by signing in below. 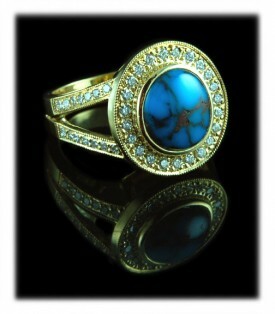 We hope you have enjoyed our presentation on American Turquoise Rings and have gained some useful knowledge from it.